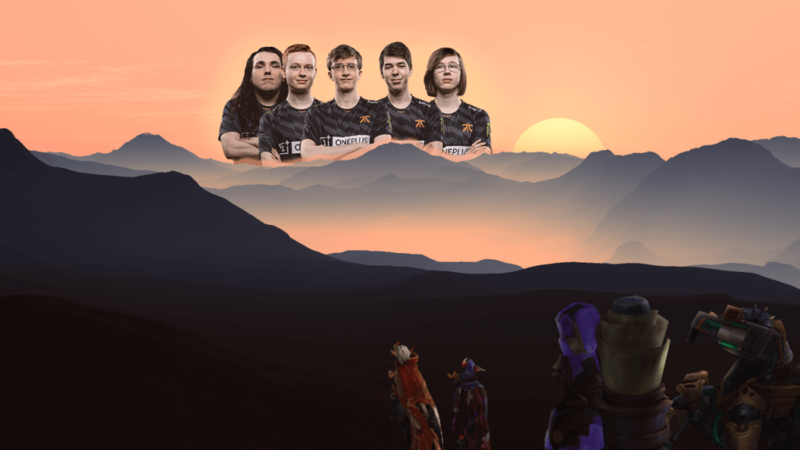 Fnatic Rising have claimed the tower. The title race is heating up! 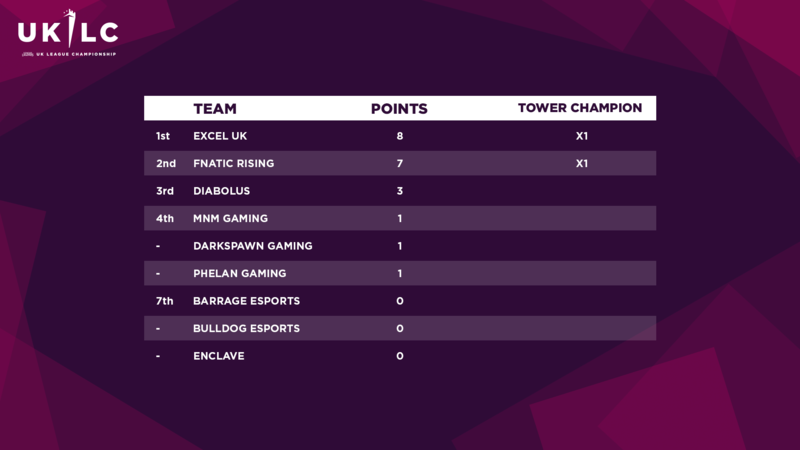 Excel UK fought for their hold on the tower but were ultimately undone by Fnatic Rising, while DarkSpawn Gaming and Phelan Gaming both impressed. 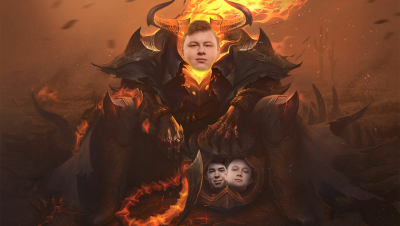 In a game with some sloppy moments—such as when both top laners secured 1v2 kills when ganked—it was Diabolus that kept clean when it mattered, and were the first to progress to the semifinals. No one could deal with Kroghsen’s Ryze in the side lanes, and no one could deal with Yusa’s Ezreal in teamfights. 🎥 QUADRA KILL! @YusaMultirole is a GOD on Ezreal! DarkSpawn Gaming seem to be going from strength to strength, and they dispatched the troubled Barrage Esports after a tremendous back-and-forth affair. DarkSpawn jungler PFI made sure the match stayed in reach of his team with a brave Baron steal, but Barrage’s defences proved tricky to breach. The result was the longest game of the week at 46 minutes and 54 seconds. ⚠️ BARON STEAL! ⚠️@Barrage set up at the big purple worm, but @TeamDarkSpawn‘s young jungler @PFI__ makes it his! Phelan Gaming are another side that are quickly rising in the community’s power rankings. In a game dominated by the Irish organisation’s side laners, MnM Gaming were put to the sword. Despite staying relevant throughout the game thanks to some well-orchestrated objective control, MnM could not secure a single kill in almost 39 minutes of play. Fnatic Rising joined Phelan in the semifinal draw after defeating Enclave Gaming with a ridiculously aggressive draft. They played a Yasuo/Gragas bot lane, while Enclave selected both Kha’Zix and Neeko, but it was Fnatic’s jungler Dan who stole the show on his Karthus. His powerful ultimates and a 25-stack Mejai’s allowed him to deal 22.3k damage to champions in just 34 minutes, almost double any other player’s output. Phelan’s semifinal debut was cut short by Kroghsen’s cruel Cassiopeia, as Diabolus pushed their mid-jungle advantage to take a comfortable win. Munckizz’s Gragas was absolutely instrumental in Diabolus’s engages as they booked themselves a spot in the bracket final. DarkSpawn followed up their participation in the longest game of the week by being defeated in the quickest. 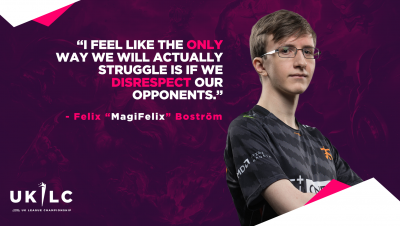 At a heavy disadvantage and with Fnatic showing members bot, they went for a desperation Baron with four members, challenging MagiFelix and Dan to outplay them. And the Fnatic duo were happy to oblige. 🎥 2v4? No problem for @FNC_MagiFelix and @FNC_Dan. Fnatic’s win set them up for a tantalising bracket final match against Diabolus, and the fixture between two teams on red-hot form delivered on all fronts. Fnatic were on the ropes and had to rely on yet another 2v4 hold from Dan—this time, alongside Prosfair’s incredible Pyke—to defend their Nexus towers. But after turning around that fight, they were able to win a scrap by the Elder Dragon and eventually end the game, after more than 41 minutes. The replay is well worth a watch! The result meant that it was time for an LEC-themed rematch in the Week 2 tower challenge. Excel UK’s bot lane had a tremendous showing in Week 1 to help their team climb to the top of the tower, with Mystique earning plaudits for his Thresh play. But xMatty and Prosfair seemed to come into this match determined to stake a claim for the title of best UKLC bot lane, as xMatty’s Ezreal accelerated to an early lead. How many people need to be sent bot lane for @xMattyyLoL to die? The game stalled out as, despite falling significantly behind, Excel threatened a repeat of last week’s tower-deciding turnaround teamfight with some excellent picks. But Fnatic were able to use their advantage and the aggressive flanking of MagiFelix’s Irelia to secure the mid lane inhibitor. 🎥 The first inhib falls! Can Excel UK weather the rising storm? It became a battle of attrition, as Taxer’s Ivern bushes helped hide his teammates’ retreats and dissuaded Fnatic’s advances. Yet eventually, the pressure was too great for Excel to bear, and Fnatic were able to brute-force their way through their opposition to take down the Nexus. 🎥 Despite a heroic hold, @FNATIC push past @EXCEL and take the tower for themselves! 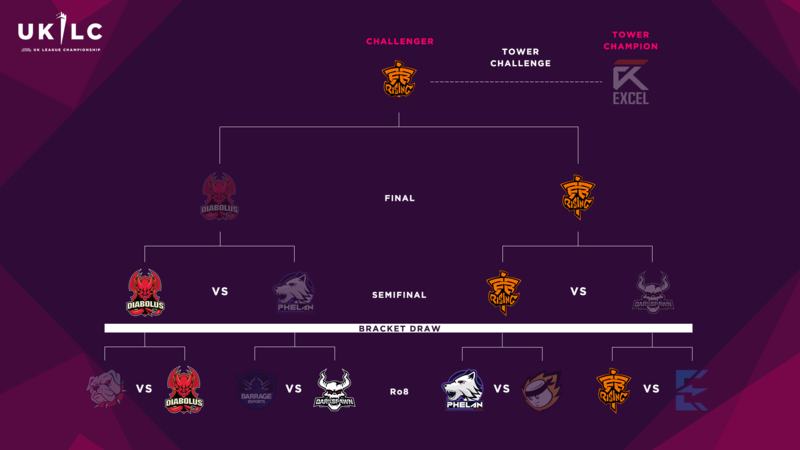 Fnatic’s victory means that no defending champion has yet won a tower challenge match. They themselves are quickly closing the gap on Excel in the overall points table, and will overtake them next week unless Excel are the ones to bring them down. 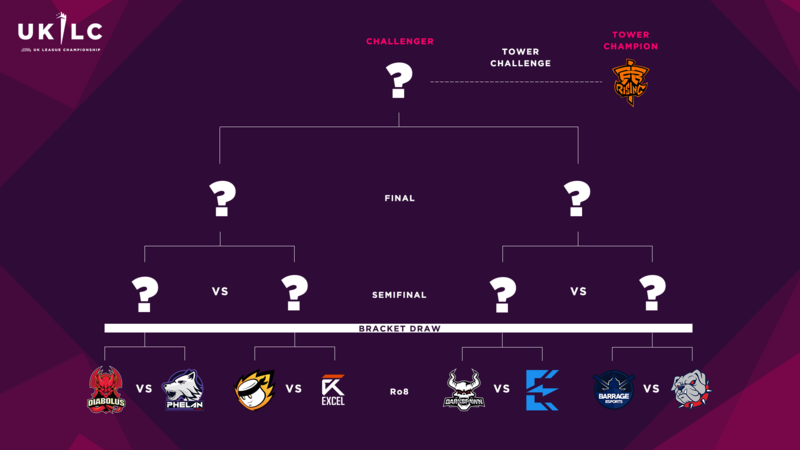 The LEC teams appear to be distancing themselves from the chasing pack, but with up to 5 points available for each team every week, the tables can change in an instant. 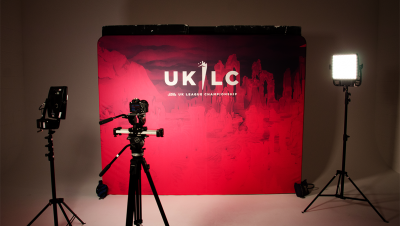 And no one is guaranteed an easy time, with a number of UKLC underdogs continuing to impress. While there’s lots to look forward to, DarkSpawn’s game against Enclave will be pivotal in determining the relative strength of the two teams, while Barrage’s match-up with Bulldogs will ensure one of the pair win their first points of the split. Make sure you’re ready by following our channel at twitch.tv/lvpuk. And stay tuned to our Facebook, Twitter, and Instagram for more updates and announcements as all the season’s drama unfolds!